Last year was one of the best for technical death metal, with many big names in the field such as Obscura, Beyond Creation and Rivers of Nihil putting out releases. It is a very hard one to top but 2019 leaves the floor open for talented young upcoming bands throwing albums at us. With the amazing record breaking second album by A Novelist already released and the likes of Fallujah, Allegaeon or Equipoise having announced releases and Virvum’s second album in the works, this year promises to shake the world of technical metal from its roots as well. 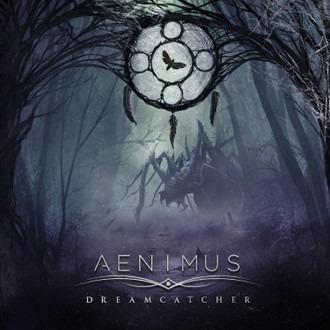 In comes San Francisco’s Aenimus with their second album ‘Dreamcatcher’ to put the theory to the test. With their progressive deathcore sound, they stray away from what tech-death usually offers placing themselves on a fine line between what the aforementioned bands play and the likes of Born of Osiris or even Periphery. On top of this bombastic combo comes a unique horror story themed concept (relating to novels like ‘The Shining’, ‘IT’, or the tales of Hannibal), an orchestral side and the amazing contribution of guest singer Mike Semesky. Have I sparked your interest yet? With no introduction whatsoever the first track “Before the Eons” slaps you in the face with a blasting fast riff following what is to become a joy-ride of progressive dynamic heavy guitars, drum grooves and occasional breakdowns. The drum work is another aspect that makes this album such a blast to listen to. It sounds monumentally heavy and energetic, but also more evolved then to just throw adrenaline at you. There a lot of melodies soaring above the djenting riffs in a metalcore kind of way, and some top class creative soloing that shreds with measure and when necessary. What makes Aenimus stand out from most technical bands is their capacity to create well-structured and organized songs that are enjoyable and easy to follow, not feeling chaotic or tiresome, as bands in this genre often do. It’s also the kind of progressive music that alternates intricate complex riffs and melodies with more straightforward sections, allowing you to grasp a lot of the music even on first listen and setting up the course for some nice transitions. The songs are constantly changing, throwing new ideas at you, so it’s hard to anticipate what comes around the corner, but because their ideas are created in a way that fits the music, not just for the sake of experimenting, it stays fun and listenable. Take the softer, clean guitar bridges as an example for the changes in mood that they can express, and letting the bass shine as well in a Beyond Creation kind of way. ‘The Dark Triad’ and ‘Between Iron and Silver’ are probably the most diverse tracks, better showcasing this capacity to always bring new ideas forward. The orchestral part of the album also helps keep things interesting and makes the album increasingly more expressive, making that horror theme felt at times (see the outros to ‘The Ritual’ or ‘Caretaker’). Lastly, the vocals in this album are a huge plus. Technical death metal vocals were always the weaker links in such albums but here, the harsh static scream is more fitted to the metalcore influence and of course it’s Mike Semesky’s clean vocal performance that really gets the vocal aspect noticed. Despite not being present everywhere, he is very memorable in songs like ‘My Becoming’ or ‘Between Iron and Silver’, running more chorus-like sections and sometimes overlapping with the screams. Ever since I heard him on Intervals’ 2014 album ‘A Voice Within’ I was impressed with his singing but I wouldn’t have expected his style to fit this sort of context. With this in mind, it becomes obvious that the band can make very different musical aspects fit together seamlessly. ‘Dreamcatcher’ merges contrasting elements into an astounding tech-death-djent-core soup. Aenimus are different then your usual technical band and I think this album would be a new and fun experience for both fans of technical metal and those into metalcore. This entry was posted in Bands, Djent, Progressive Metal, Reviews and tagged 9/10, Aenimus, deathcore, djent, Dreamcatcher, Intervals, LP, metalcore, prog, progressive death metal, progressive metalcore, San Francisco, technical, Technical Death Metal, things that sound like djent but aren't actually djent, usa.